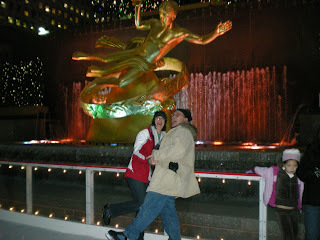 For our Christmas presents to each other we decided to go to NYC for the Christmas season. It was so much fun. We spent a couple of days just touring around and seeing the sights. I love NYC and so does Jim. This was a perfect gift for us to share. 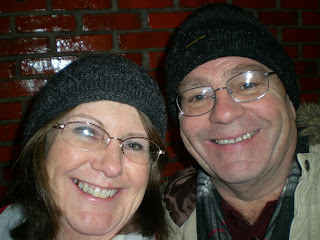 Jim and I took the subway to Canal st. He usually takes a taxi but I talked him into trying the subway. It was really an adventure. Of course everything we do is an adventure. 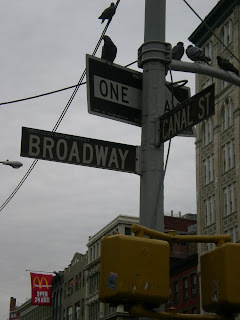 The first thing that we did when we got to NYC was go to Canal street to do some shopping. Jim was there a long time ago and I was there just a couple of years ago with my sisters. So it was fun to go back. We ended up in a van. Jim wouldn't get in. The lady kept saying you get in and Jim would say no. I couldn't believe how many police were there this time. It kinda took the fun out of it, especially since everyone thought Jim was an undercover cop. The sales people wouldn't help or show us anything. So we bought a couple of items below the asking price and left. 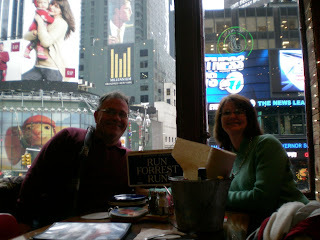 We had lunch at Bubba Gumps in Times Square. The city is so festive at this time of the year. After lunch we headed out for some serious shopping. 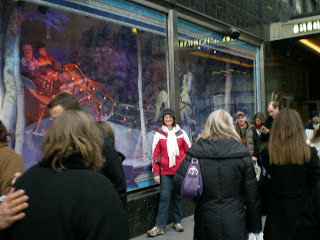 This is one of the windows on the tour of department store windows. It was so fun to look at all of the windows and how they were decorated. The stores went all out. The Sleigh rocked back and forth. The picture really doesn't do it justice. This is Santa checking the naughty and nice list. Notice who is standing in front of this window. Of course we all know which list he is on. That is why I am not standing there. 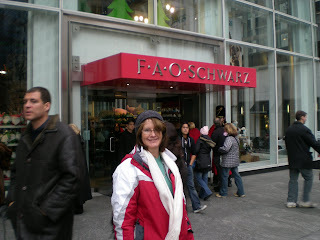 Of course we had to go to the famous F. A. O. Schwarz toy store. It was great to go into and see everything that they had. This is the door man. He was so nice. He let people take pictures of him with their children, wives, and families. 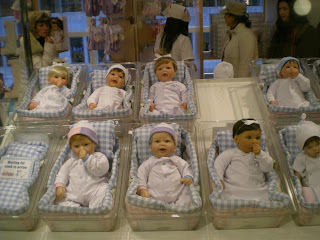 Dolls Dolls everywhere. I love dolls. I couldn't decided which one I wanted to buy, so I didn't get any. There where so many to choose from. Jim said it looked like a pediatric ward. 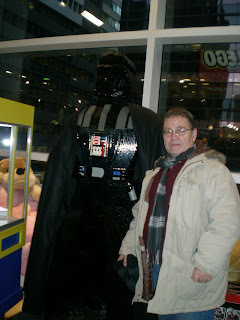 This Darth Vader is made up of lego's Ryan is really into lego's so I had to this picture for him. 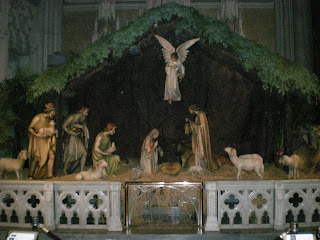 We went to Saint Patrick's Cathedral. They had a large nativity in there. It was so neat but the baby was missing. They said that it was because he wasn't born yet. I thought to my self well then the shepherds and the wise men shouldn't be there either, but it was still neat. Jim bought me a beautiful nativity from there. This I believe is number 77. 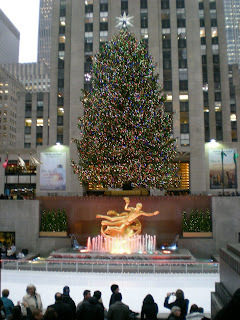 The tree at Rockefeller Center. It was so pretty. 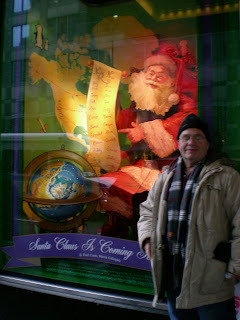 It was so much fun to be in NYC for the holiday season. 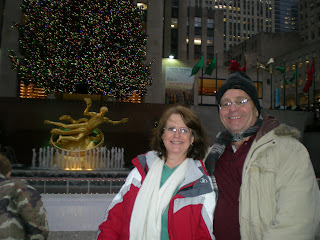 This is us in front of Rockefeller Center. It was such a great day. The wind was blowing but not to cold and not snowing or raining. Yes, I fell down but nothing hurt except my ego. I was trying to turn to take a picture of Jim coming up behind me and down I went. Jim said wait right there until I take a picture, so by the time he was done I really had a wet bottom. 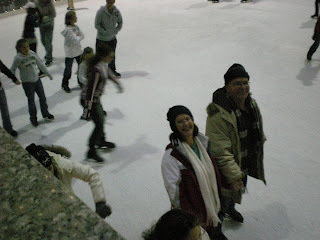 Jim, enjoyed himself even if it took a little while to remember how to skate. He might not look like a professional (pathetic) but at least he didn't fall. 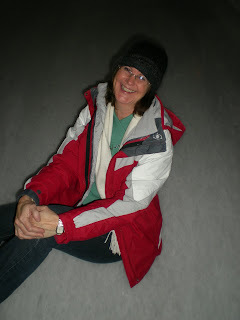 Here I am showing how great I really can skate. But I tell you right now it is a lot of work and I realized that for 2009 I will need to get into better shape if I want to do this again. We got pretty good towards the end of our skating. We had such a great time. 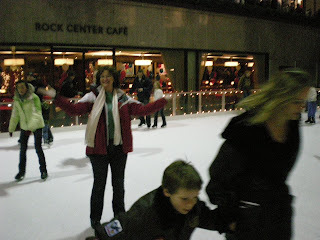 I just kept saying that I can't believe that we were there ice skating at Rockefeller Center. 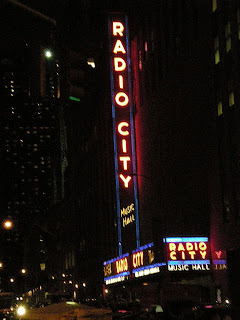 We thought about which show we wanted to go and see while we were in NY and finally decided that we wanted to go and see the Rockettes Christmas Spectacular at Radio City Music Hall. 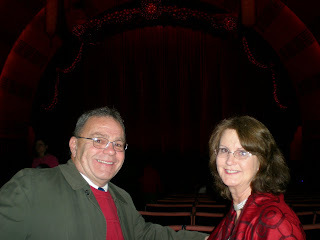 I had heard all about them since I was a little girl and was really excited to go and see the show. This is inside of the theater it was great to be there. I have always wanted to see them and I have enjoyed dancing since I was 3. This is at the end of the Rockettes' Christmas show. 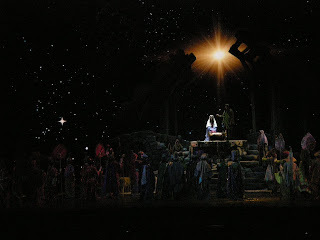 It was so neat that they portrayed the birth of Christ. I was really surprised and thrilled. It was the perfect ending of our trip. Wow..what a great trip and you guys did so much. I always remember you saying how much you love NYC. What a great present. Who took all your photos of the ice skating? We asked different people to take them. We also took them of each other. It really was a great trip. Ohhhh, I'm so jealous. 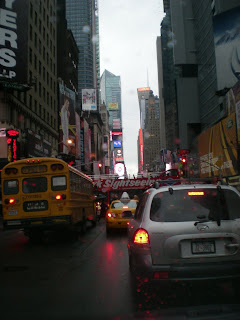 I love NYC and Canal St. shopping!!! I could do that all day long, so fun! I would love to go there during Christmas. What a great gift to each other! What a fun trip! I can't wait to go to New York. Maybe someday when I'm not too busy having babies I'll get to go. 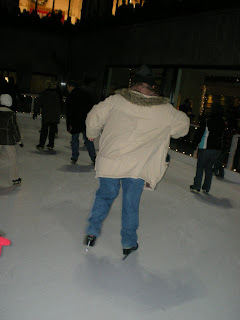 Although I don't think I could get Aaron to ice skate, he's really scared of anything slippery. Looks like fun. 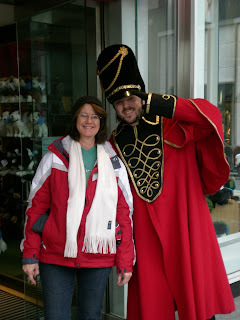 Becky and I were trying to plan a NYC christmas vist but it didn't work out.